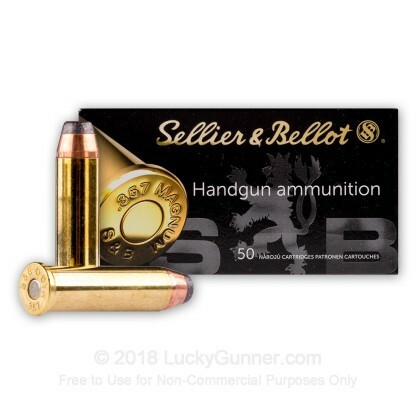 Sellier & Bellot is an ammo company from the Czech Republic, which is probably why no one seems to know how to pronounce their name. S&B has been in the ammo business for a long time, establishing their roots in the 1820s. And today they make ammo for civilians, military forces, and law enforcement in countries all over the world. 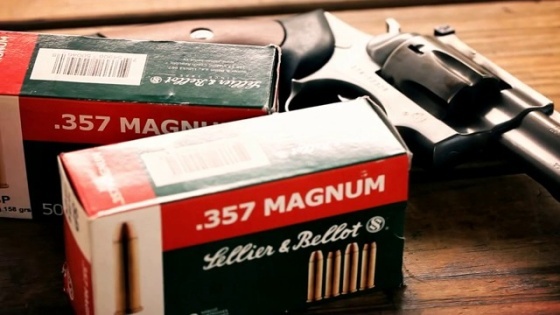 Today, we're looking at one of S&B's 357 Magnum loads. Like most of their other ammo, this one features a reloadable brass case with a noncorrosive primer. The bullet is a 158 grain soft-point. The lead core is partially covered in a copper jacket, leaving the flat tip of the bullet exposed; this is to aid in expansion for hunting and self-defense use. There are a lot more sophisticated expanding bullets on the market, but some people swear by the jacketed soft-point. And in some hunting applications, it may penetrate better than a hollow point. We tried out this round at six different test guns-- five revolvers and one carbine. The recoil was relatively stout. It was no problem in our rifle but was quite a handful in our smaller revolvers, like this Smith & Wesson K frame. We did fire a couple of rounds in our Ruger snub nose. But it's not something I'm eager to try again. 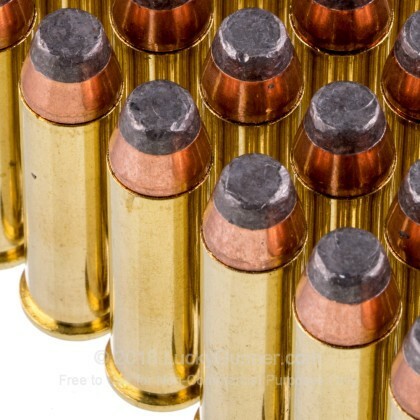 Besides fighting the recoil, we didn't have any other issues with this ammo. Ignition and extraction were no problem. And accuracy was excellent. We shot this 10 round group from our bench rest at 25 yards, using the Marlin carbine. Even with a brisk break of fire, it was no problem to keep all the rounds inside the 10 ring. S&B has developed a well earned reputation for consistency and reliability. And this 357 load is no exception. 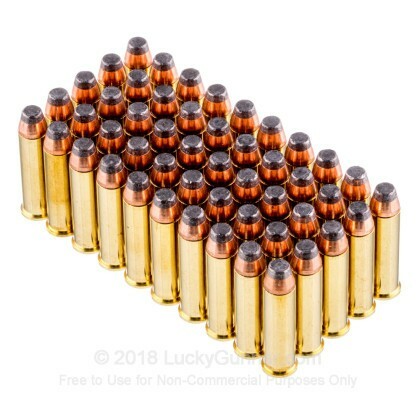 Even with the old style jacketed soft-point bullet, I would expect this ammo to perform adequately. 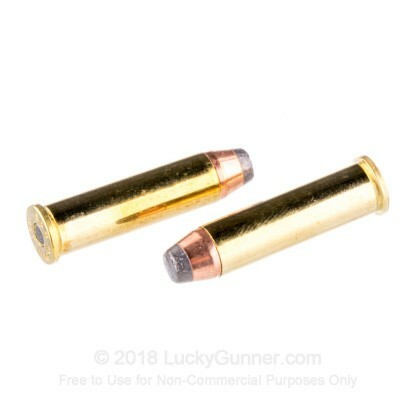 And it would make a good alternative to some of the premium priced hunting and self-defense rounds. 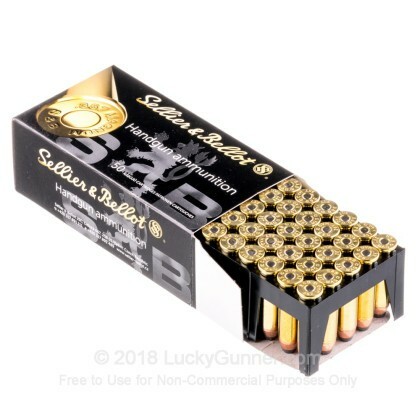 We don't have any reviews yet for this particular .357 Magnum ammo from Sellier & Bellot. 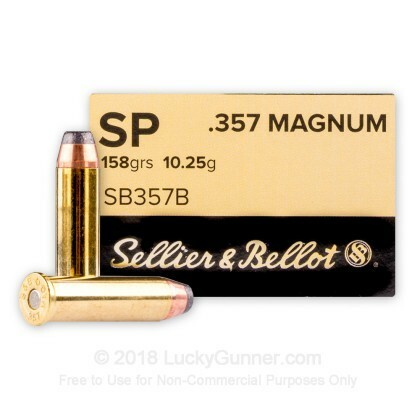 If you'd like to be the first to review this particular .357 Magnum ammo from Sellier & Bellot, fill out the form below.